Water trucks have become indispensable to farmers around the country. If you’re a farmer and you’re thinking about renting a water trunk, it’s important to understand exactly what they are, how you can use them, and why they’re going to make your life a whole lot easier. Water trucks are different from regular trucks in design. A water truck has a special tank, a custom chassis design, a custom mounting apparatus, and pumping equipment that helps you get the water out of the truck quickly and easily. Water trucks come in a range of sizes with the largest able to carry up to 36,000 liters of water. At BigRentz, you can choose between two sizes, the 2,000 to 2,999-gallon truck or the 4,000 to 4,999-gallon truck. Many are even designed for getting out into the field and come with off-road tires so that you can take them wherever you need them. How you fill and spray the water from the truck will vary depending on which truck you choose to rent. Most fill nozzles are located on the top of the truck, while the spray nozzles are usually located at the front or side of the truck and are controlled from inside the truck’s cabin. Water trucks were first used by miners as a way to control and compact dust as well as to help prevent fires. However, water trucks have now become vital to many farmers around the United States. One of the main reasons farmers began turning to water trucks was due to the intense drought that was being experienced throughout the Midwest and west coast of the country between 2011 and 2016. Farmers struggled to keep their crops alive with the water that was available. Water trucks allow you to ship in water from other parts of the country that are not experiencing a drought so that you can continue to keep your crops alive no matter what the rain decides to do this year. Who Needs Water Trucks Most? In 2014, numbers showed that ten percent of the water consumption in the state of California was from almond farmers alone. In a state that experiences droughts on an almost yearly basis, it makes sense that almond farmers should be the first people to begin using water trucks. California’s central valley is the king of America’s agriculture. Much of our produce for the entire country comes from this region. As more agriculture is demanded by the country’s growing population, farmers around this region will notice an increase in water shortages. If that’s you, renting a water truck can begin to benefit you right now. Farmers who have a lot of livestock will also benefit greatly from having a water truck during droughts. In order to keep your animals healthy, they need to be hydrated. If you’re in a drought, that last thing you want is to lose your livestock. Just be sure the water you are using is potable drinking water. 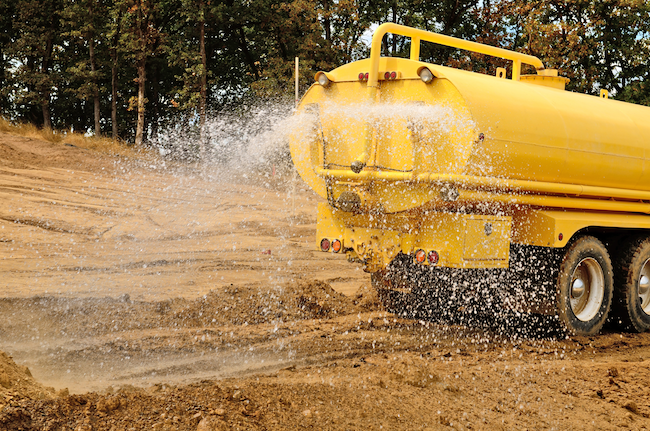 In addition to dealing with impending droughts, renting a water truck can save you tons of money in the long run. You don’t want to wait until you are out of water before you call up BigRentz and have a water truck delivered. This could mean a complete catastrophe for your crops for an entire year and a huge loss of income. Even if you are not farming in California, many states have incomplete data about how much groundwater there is. You could be in a place that hasn’t recently experienced a drought but is well on its way to running out of groundwater. Water trucks also allow you to use only the exact amount of water that you need. Water trucks can help farmers reduce the amount of water waste throughout the year because you are paying for each drop. If you are a farmer who believes in reducing the use of groundwater in your area, you want to reduce water waste in general, or you are struggling to grow your crops in the middle of a drought, renting a water truck is a fantastic solution to your problems. Call BigRentz today to speak to one of our representatives about which water truck would be right for you and the jobs you need to tackle. We can explain exactly what the process is to rent a water truck and can likely get you all set up in less than 24 hours.